This month we have a wonderfully wide range of great reads for kids – a beautifully designed paper-cut board book, a coterie of award winners and kids fiction that puts climate change and the environment front and centre. Find our February picks for YA books here. 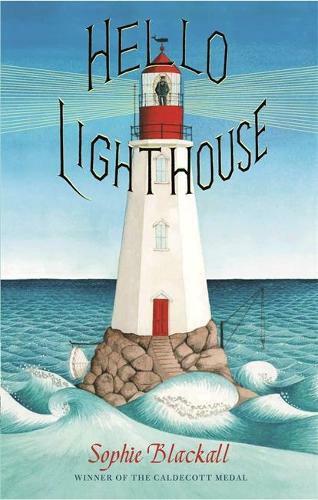 Follow the daily and seasonal ebb and flow of activity around a lighthouse and its solitary lighthouse keeper in the delightful, Caldecott Medal-winning, Hello Lighthouse. This book features dramatic aerial illustrations and gentle little windows into the interior life of the keeper, combined with poetic text and the lovely light-sweeping refrain of ‘Hello…hello…hello!’ As the seasons change, so does the life of the keeper, as his lighthouse family grows. Young readers are exposed to basic colours, and encouraged to find animals, fruits, flowers, vehicles and other objects in this artfully produced board book that features paper cutouts and intricate illustrations. Renowned Japanese paper-cut artist, author and illustrator Takeuchi has created a beautiful and stimulating book for small readers aged 3 and up. Poor Melody Trumpet has been born into a famous musical family, but instead of being a musical genius, she’s seriously melodically challenged. Ten-year-old Melody is hidden away from the world by her odious parents, but the Battyville Elite School for Musically Gifted Children Debut Gala looms. Help comes in the form of some unexpected friends – Clementine, Freddie and The Workshop – and Melody finally has a chance to find her talent and her perfect place. Our reviewer Claire recommends Melody Trumpet as ‘a great adventure about finding your own voice and being happy with who you are.’ For ages 7 and up. Ella and Emery must flee the starving city and trek across dauntingly harsh country to reach their mum. The world is in the grip of a famine caused by a fungus that has killed all the grass. Together with their five loyal dogs and a sled, Ella and Emery set out across the ravaged Australian landscape, encountering dangerous and desperate people and situations. Our reviewer Bec highly recommends this timely novel: ‘In a time where young readers find themselves facing the uncertainty of climate change and global warming, The Dog Runner is a powerful imagining of things to come, and a reminder of the importance of kindness in the midst of uncertainty.’ For ages 10 and up. It’s the 7th February 2009, and the temperature has soared to 47 degrees. Zeelie and her father are at home in Flowerdale enacting a ‘stay and defend’ fire plan, while her mother and brother have set out for the city to get her brother’s suspected broken arm looked at. When the wind changes direction, and power and communications falter, Zeelie and her father are faced with difficult decisions and mounting tensions. This gripping and authentic action story is based on D'Ath’s real-life experiences during the Black Saturday bushfires. Mila and her sisters live together with their brother Oskar in a remote and snow-bound cabin in the great forest of Eldbjørn. After allowing a group of strangers to shelter overnight, Oskar disappears, and Mila is convinced that he has been kidnapped. Mila embarks on a dangerous quest with her huskies and sled, little sister Pipa, and new friend Rune in this atmospheric tale. Award-winning author Millwood Hargrave is known for her lyrical prose and questing young girls, and our reviewer Natalie describes this novel as ‘mythic in stature and full of wonder and enchantment.’ For ages 8 and up. Bored 11-year-old Winnie is roaming in the woods when she comes across a boy drinking from a spring. Winnie wants a drink too, but instead is kidnapped and spirited away by the mysterious Jesse Tuck and his family. The Tuck family drank unwittingly from the spring many centuries ago, and were blessed – or cursed – with immortality. Winnie finds herself caught up in the Tuck’s secrets, and also in their desperate actions to keep them safe. Our reviewer Alexa has revisited Tuck Everlasting several times, and remains enchanted by the ‘beauty and simplicity of Natalie Babbitt’s writing’ and the subtle exploration of the implications of immortality. For ages 10 and up. We’re already excited to think about all the kids books we’re going to read this year, so we’ve prepared a long list of our most anticipated children’s books of 2019. There are great new Aussie books, international superstars, next instalments in long-running series, fantastic non-fiction, and much much more. The winners of the prestigious American Library Association (ALA) awards were recently announced. The John Newbery Medal for the most outstanding contribution to children’s literature was awarded to Merci Suárez Changes Gears by Meg Medina; and the Randolph Caldecott Medal for the most distinguished American picture book for children went to to Hello Lighthouse by Sophie Blackall. You can see a full list of winners here. The Costa Book Awards, which honour some of the most outstanding books of the year written by authors based in the UK and Ireland, were announced early last month. The Children’s Book award was given to The Skylarks' War by Hilary McKay. Find out more about the awards, including winners for novel, biography, poetry and debut novel here. The first day may have come and gone, but adjusting to starting school takes a while. We put together a selection of our favourite books to help with starting school, covering first days, friendships, anxiety, pre-school environments and more. This month you can enjoy a nature-themed story time with Renée Treml reading from her new picture book, Sleep Tight, Platypup. In this sweet story exploring fear of the dark, Platypup’s mother helps him to see that his home by the river is just as lovely at night as it is during the day. Story time is on Saturday 16 February 2019, 10:30am at Readings Kids. This event is free, but please book here. And join us for the launch of The Squid, the Vibrio and the Moon on Sunday 17 February 2019, 2:00pm at Readings Kids. This is a beautifully illustrated storybook about the Hawaiian bobtail squid and the bioluminescent bacteria that help it glow in the moonlight. Free, no booking required.